With over 20 years of experience in the oral care industry, AL Khair now launches its Miswak Toothpaste, with real Miswak (Salvadore Persica) extract. With the natural benefits of Miswak for healthier teeth and strong gums, Miswak toothpaste helps protect tooth enamel and suppresses the growth of bacteria. AL Khair Miswak Toothpaste helps you maintain good oral hygiene, keeping your dental problems away. Miswak contains natural ingredients such as sodium chloride, sodium bicarbonate and calcium oxide which help whiten your teeth. Miswak significantly reduces the chances of gingivitis and periodontitis keeping your gums healthy, and you happy, all through. Miswak has been known to increase the formation of saliva in the mouth without the need for any commercial enhancers or additives, thus naturally fighting tooth decay. Miswak due to its antibacterial properties prevents the bacteria from accumulating on the teeth and gums, hence reducing plaque. Real Miswak Extract is added to its formulation so provide natural benefits of Miswak. Miswak, a natural toothbrush, known for its natural oral care benefits, has been used since ages by Middle Eastern & African societies as a natural method for cleaning teeth. 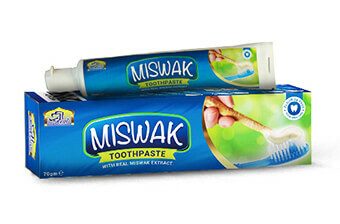 Adding Real Miswak Extract ensures the natural benefits of Miswak, now in a toothpaste. Fluoride is a highly toxic substance. This is why the FDA requires a poison warning on every tube of fluoride toothpaste now sold in the US. It is also why accidents involving over-ingestion of fluoridated dental products–including fluoride gels, fluoride supplements, and fluoridated water–can cause serious poisoning incidents, including death. The use of fluoride toothpaste, particularly during early childhood, presents health risks. Risks from ingesting fluoride toothpaste include permanent tooth discoloration (dental fluorosis), stomach ailments, acute toxicity, skin rashes (perioral dermatitis), and impairment in glucose metabolism. While a lot of people think that fluoride prevents tooth decay, most of us don’t realize that fluoride can actually cause a type of tooth decay called dental fluorosis – most commonly observed in children. Harmful effects of fluoride have also been linked to osteoporosis, thyroid problems, endocrine problems and cancers, just to name a few. There are many studies that support these probable links available out there. Because of all the side effects of Fluoride, AL Khair Miswak toothpaste has been formulated ‘Fluoride Free’, to provide humanity a healthier alternate to conventional toothpaste.